This summer we had the privilage of touring with the legendary Guitar Wolf. 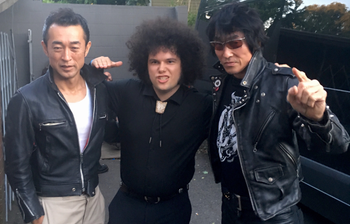 Since 1987 Guitar Wolf have been Japan’s answer to The Ramones. They put on an incredible and inspiring live show and as the opening band we got to see it 17 times in a row! It was the perfect combo. We got the crowds warmed up and moving with our ghoulish rhythm n’ blues and Guitar Wolf obliterated audiances with their “Jet RockNRoll”. Guitar Wolf always do a ceromonial huddle before going on. While no one knows for certain what goes on during this ritual. Rumor has it that singer/guiarist Seiji shouts out the nights setlist for the band to commit to memory. After the huddle, they put on dinosaur masks and take the stage. 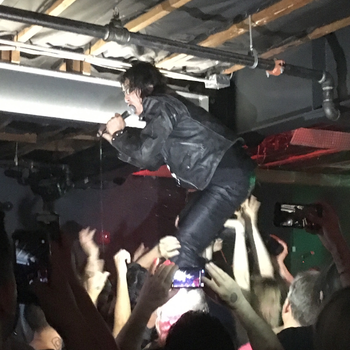 Guitar Wolf not only play a different set every night but they also vary their stage antics. Antics that range from crowd surfing to pulling members of the audience on stage, sometimes to let them play guitar (whether they know how to or not), and other times to form a human pyramid. 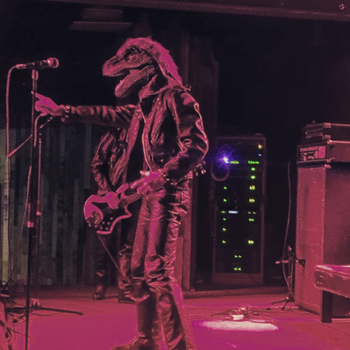 One of the most immpressive things about Guitar Wolf is their commitment to wearing leather. This was a Summer tour, and Summer 2017 had recording breaking heat waves. Couple that with packed clubs of screaming fans and you can imagine how hot things got. But no matter what Guitar Wolf would be rocking in leather pants and jackets. One of their most impressive feats was an outdoor show in Las Vegas with 110 degree weather. I was melting but Guitar Wolf didn’t miss a beat. Incredible! At the end of the tour Seiji and the rest of Guitar Wolf invited us to a get together at Steve Base from the Devil Dogs house. Other luminaries at the party included memebers of The Phantom Surfers and The Wogglies. Seiji cooked everyone some delicious Japanese cuisine and got me drunk on sake’, beer and wine (yes all three). Before flying back to Japan Seiji imparted some final wisdom on me. It was a series of principles that were the secret to his success. He called it Rock n Roll Science. # 1: Looks. To play Rock N Roll a band must look good. # 2: Action. Rock N Roll must be action packed. # 3: Power. Rock n Roll music must be powerful! Those concepts are so important that according to Seiji principles # 4, # 5 and # 6 don’t matter. He didnt even bother to name them. However, he did explain that trailing at a distant last is priciple # 7: Technique. The least important part of Rock N Roll is technique. If you have looks, action and power than Technique is not impartant. Long Live Rock n Roll! Long Live Guitar Wolf! Next Article Phantoms at Thrasher Magazine Skater Of The Year Party!